Making gingerbread houses is a traditional art form in many European countries and dressing up a typical gingerbread house as a classic country barn can be a new holiday project for everyone to enjoy. From start to finish the project will take 3-4 hours, so spread it over a few days and take your time. The results are worth it as this Gingerbarn makes an enchanting centerpiece for a party or a wonderful gift and adds sweet country style to any season! 1. Make your favorite gingerbread dough recipe according to instructions. While chilling and before rolling dough, cut out barn patterns from sturdy cardboard. 2. Roll out one-third portion of the dough 1/4 inch thick on a surface dusted lightly with flour. Place cardboard patterns for barn front and two sides on rolled dough. Using a sharp knife, cut around patterns. Remove excess dough; reserve with remaining dough for rolling other barn pieces. 3. On barn front cut two doors using a sharp paring knife cut but do not remove dough. Lightly, cut a circle outline above front barn doors. 4. On side pieces, cut doors, again keeping dough in place. Cut side windows completely; remove dough pieces and add to reserve. 5. Cut red and green Life Savers candies (one of each) into small pieces and place inside circle to create hex. Be sure to place into dough above door before baking. 6. Repeat process; roll and cut barn back, four roof pieces and base with remaining dough. 7. Bake pieces according to instructions. Remove gingerbread from oven. When gingerbread is still warm, re-cut the doors from front and side and remove; cool on pan for a few minutes. Finally, transfer all pieces to a wire rack to cool completely. Let all pieces dry completely, preferably overnight. 8. Meanwhile, using scissors to trim to size, cover potato chip can with red construction paper. Join seams by using double stick tape along edge of paper. Cover tennis ball with aluminum foil and place in top of can. 1) Cut a 14x11-inch piece of cardboard for the base of the barnyard. Cut two pieces of cardboard from the barn back pattern for roof supports. 2) Prepare royal icing according to instructions and insert small amount into bottom pastry bag with tip. Refill pastry bag with icing as needed throughout project, never filling bag too full. As it’s the “glue” for the house and candy, always use generously. 3) Assemble four barn sides onto gingerbread base. To join barn sides to back and front pieces, pipe icing cleanly along edges to be joined. Press barn pieces together and hold for several minutes. Once four walls are firmly together on gingerbread base, adhere to cardboard base with frosting. Then insert your two cardboard cutouts into center of barn. 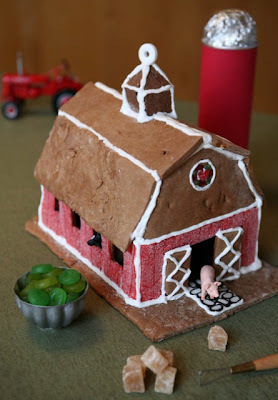 Secure with icing to sides of barn. Let dry completely, preferably overnight. 4) Using scissors cut sour tape into strips to create vertical barn siding. Carefully using icing like glue, apply siding to barn sides. Using royal icing, apply doors to front and sides, adding zigzag barn pattern to doors. 5) Using small amount of icing on feet, add cow to inside of barn, so she’s peeking out of side window. 6) Pipe frosting on top edges of barn and center supports. Press roof pieces into place, holding for several minutes to insure proper fit. Pipe frosting into seams between roof pieces. Let roof dry completely before adding cupola. 7) Using sharp knife cut several chocolate graham crackers cut into quarters. With four pieces, use icing to adhere cupola walls to roof. Then, cut four triangle pieces of graham cracker. Using icing, adhere triangles to form peak. Once completely dry, add Life Saver candy to peak. 8) Cut licorice into small pieces and make licorice pathway. Using scissors cut a small heart from Sour Gummi Tape® and adhere to center of hex. Great posting. My 6 year old niece would love making this! !